I love you enough to say "no" to sleepovers, dating at a young age, and data on your phone. I love you enough to say "yes" to *at least* weekly Mass, regular Confession, and family prayer time. I love you enough to say "no" to any kind of TV or video game time during the school week, to too many sports leagues, to letting you spend your money on unwise choices. I love you enough to say "yes" to home cooked meals that include vegetables, early bedtimes, and nightly showers/baths. I love you enough to say "no" to dessert if you don't eat dinner, playdates if your chores aren't finished, and bringing you to every.single.birthday party you're invited to. I love you enough to say "yes" to good manners, eye contact, strong handshakes, and including outsiders. I will always say no to sibling fights, bad attitudes, ungrateful or impolite kids. I will always say yes to anything that I don't have a good reason to say no to. I will always say yes to family time, dance parties in the kitchen as we clean up, snuggle time in my bed, helping you with your school projects, letting you help me cook, having one on one dates with you, celebrating all your victories and comforting you in your losses. Hugs and kisses are always welcome and words of encouragement are quick to come from my tongue. Rules don't make unhappy families. Rules create peace and order and respect. Rules don't exist because I am mean. They exist because I love you so much. I read somewhere that we need to raise our children to be people we want to spend time with. Isn't that a good thought to keep in mind? Who wants to indulge a child's every whim and then have to deal with an entitled adult for the rest of their life? I know it's my job to raise these humans (with their awesome father) and I will make many mistakes along the way. But I will keep trying because I'd rather correct an issue during childhood then try and rewire an adult. Plus, you know, the whole final judgment thing. As for ALL THE OTHER KIDS WHO GET TO DO ALL THE THINGS, well, as I tell my children: Different house, different rules. Their parents are trying their best to raise the kids God blessed them with. Different parents and different kids are gonna mean different rules for everyone. One day, God willing, you can have your own house and rules and kids to manage. And I will be there to smile in empathy when your kids call you mean. Then I'll take them out for a treat, because a grandma's gotta do what a grandma's gotta do! My kids also go to bed early and the bulk of other things. 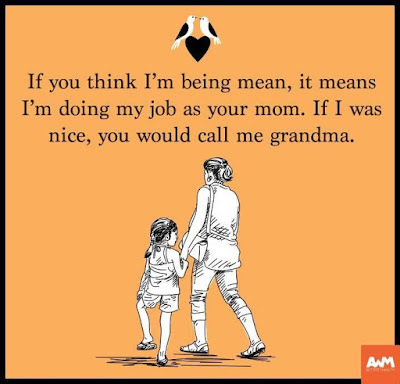 Luckily my kids are still pretty little and do not yet realize that I am being mean. :) Not that I care. Getting enough sleep makes everyone happy. 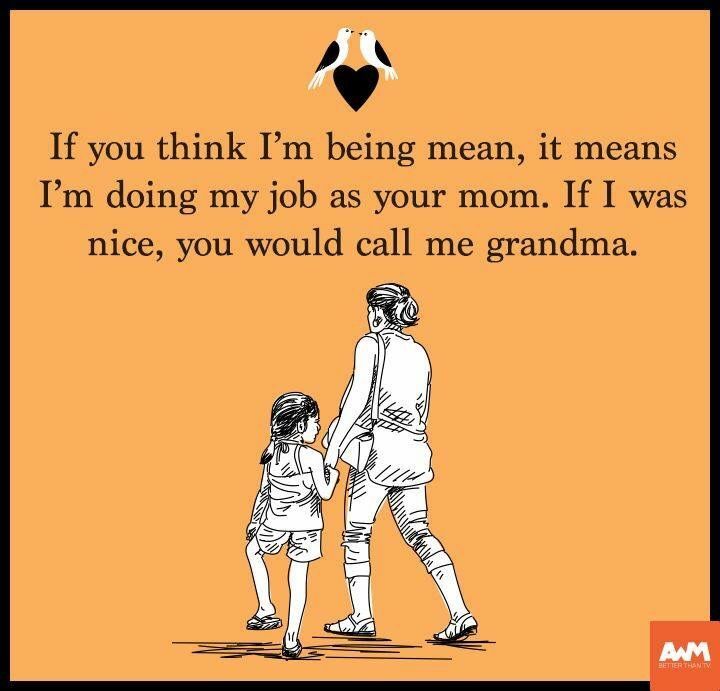 My dad laughs every time one of my kids calls ME mean, because when I was a kid I said the same thing to him!! Now he gets to spoil them like a grandpa should!! Fun how life is like that! Last month my four grandkids, ages 4, 8, 9 and 13, spent the weekend with us and at one point in the evening asked if they could stay up late because their mother never lets them. Well, I'm sure you know what I told them, haha. ;) They were still going strong at 11:30 pm but this granny was pooping out so we all finally went to bed.